I am wearing my version of Uncle Sam. 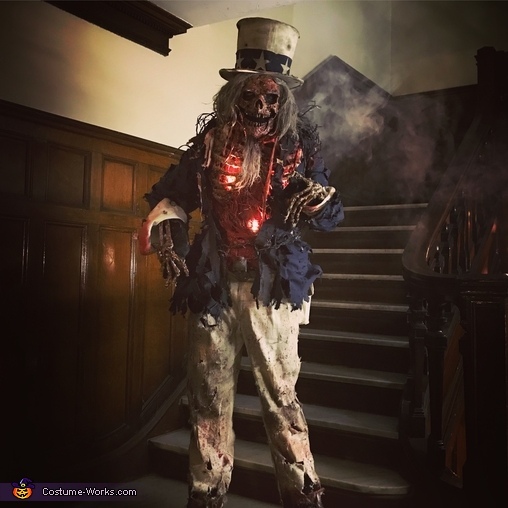 A “Zombie Uncle Sam” costume design and built by myself. I wanted to do a zombie costume this year and as I was building the base of it. I thought it would cool to make him Uncle Sam, since the state of politics are the way they are now. I built this costume to march in the 2017 nyc village Halloween parade. It was well received to say the least. I love Halloween. I love to build amazing detailed scary costumes. I see it as a art form and an outlet for my creativity. Something you don’t see in pictures is the smoke come off my back.